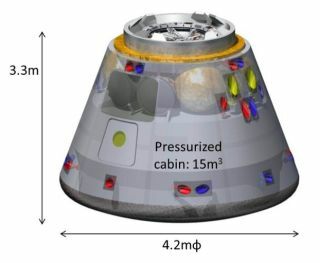 A diagram of a crew capsule being developed by the Japan Aerospace Exploration Agency (JAXA). Japan hopes to be launching astronauts aboard a manned capsule or space plane by 2022, and the nation is also eyeing point-to-point suborbital transportation over the longer haul. The capsule or mini-shuttle — which may resemble Sierra Nevada's Dream Chaser space plane — would each accommodate a crew of three and carry up to 880 pounds (400 kilograms) of cargo, officials with the Japan Aerospace Exploration Agency (JAXA) said this month. The mini-shuttle would weigh 26,400 pounds (11,975 kg) and land at one of five suitable runways worldwide. Because a launch abort from Japan’s Tanegashima Space Center would mean a Pacific Ocean landing, the space plane would also have to be able to cope with the sea. The heavier capsule would be able to land on solid ground, while the lighter model would only touch down at sea. JAXA also foresees further development of the capsule for exploration beyond low-Earth orbit, officials said. JAXA officials presented the human spaceflight concepts at the at the International Astronautical Federation’s meeting in Naples, Italy, earlier this month. Development of the crewed capsule will follow an unmanned reusable cargo capsule, called the HTV-R (R for "recovery"), which JAXA is planning as an evolution of its expendable H-IIB Transfer Vehicle (HTV). The HTV has delivered cargo to the International Space Station three times, with the most recent trip coming in July. The current HTV spacecraft's pressurized cargo section would be replaced by the recoverable capsule, which is made of an aluminium alloy. Development of the HTV-R begins next year, and the first flight is targeted for 2017, JAXA officials said. "For HTV-R we are asking for funding for this coming year, and we are expecting next year to start development phase for HTV-R, and for the crewed capsule we are conducting some key technology research," Kuniaki Shiraki, JAXA’s executive director of human space systems and utilization mission directorate, told SPACE.com. "This year on these [manned] technologies we are spending $600,000." Shiraki was among those who spoke at the 63rd annual International Astronautical Congress. The recoverable capsule will use some of the same technologies as the current HTV, including its systems for rendezvous and docking, power, communications, and guidance, navigation and control. But the HTV-R will require development of some new gear, such as thermal protection, accurate re-entry guidance and parachute systems. Both the HTV-R and the manned capsule would have an internal volume of 529 cubic feet (15 cubic meters), JAXA officials say. The cargo capsule would be 13.8 feet (4.2 m) wide and 10.8 feet (3.3 m) tall, with a dry mass of 9,680 pounds (4,390 kg), and it would re-enter the atmosphere ballistically. Diagram of the launch configuration of Japan's proposed HTV-R recoverable cargo capsule. While the HTV, and eventually the HTV-R, are launched on the H-IIB rocket, all three of the proposed manned vehicles — the two capsule variants and the mini-shuttle — would be launched by a newly proposed rocket called the H-X. The H-X will be a new design with higher reliability for human-rated launches, and it's slated to become operational in the 2020s. Its prime contractor is Mitsubishi Heavy Industries (MHI). Concept studies and research for key technologies have been carried out to decide the H-X baseline configuration and to assess its feasibility. As a result, a fully liquid propellant vehicle with a single two-stage core that uses a solid or liquid booster stage for heavy and geostationary orbit payloads is MHI’s baseline design. The H-X’s engines will cluster together a higher-thrust evolution of JAXA’s LE-7A engines called the LE-X, which is now in the research phase to verify its feasibility, safety, reliability and cost-effectiveness, officials say. Japan's spaceflight plans don't stop with the HTV-R evolutions and hopes for a mini-shuttle. JAXA also has a long-term reusable space plane feasibility study underway that includes a road map. This road map envisions a rocket-powered suborbital point-to-point (PtoP) vehicle with a 1,242-mile (2,000 km) range, as well as another PtoP vehicle with a 6,213-mile (10,000 km) range and a fully reusable two-stage-to-orbit manned space plane. The shorter-range PtoP vehicle is a rocket glider weighing 118,800 pounds (53,520 kg). It coasts toward its destinations after achieving a speed more than 14 times the speed of sound using staged combustion aerospace engines. The longer-range PtoP craft has a waverider design and a total weight of 660,000 pounds (299,370 kg). It would also glide to its target after accelerating to hypersonic speeds — in this case, about five times the speed of sound — but it would be capable of longer hypersonic cruises. This hypersonic aircraft’s design has a forebody that compresses the incoming air for the propulsion system, which combines a rocket with a ramjet. Plans for the reusable two-stage-to-orbit manned space plane currently call for a vertical launch, though a horizontal takeoff may also be considered. In either case, both its booster stage and the 60-foot-long (18 m) orbiter it carries would land on a runway. The vehicle exists only on paper at the moment. Howerver, JAXA is working toward ground-based engine tests and plans flight tests in five years or so.